1. 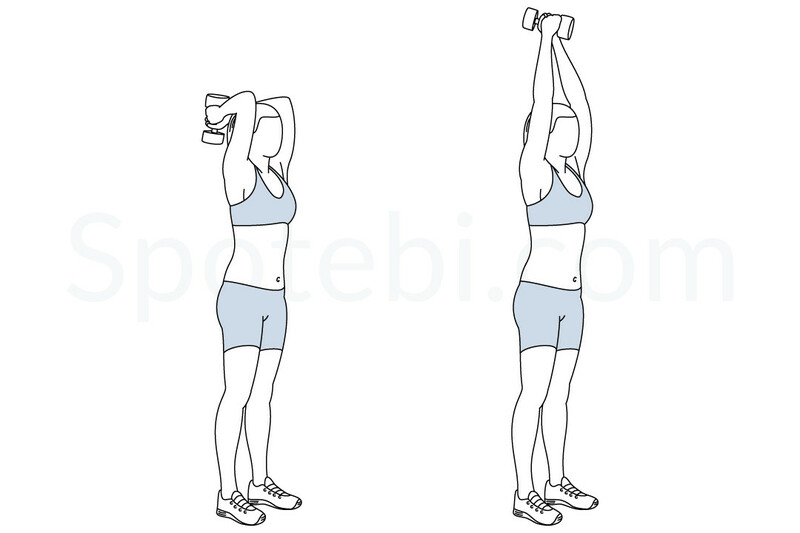 Grab a dumbbell and stand straight with your feet shoulder-width apart. 2. 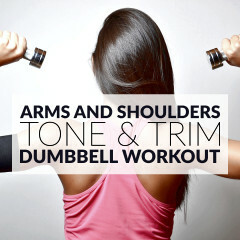 Raise your arms and, with your elbows pointing forward, start lowering the dumbbell. 3. Slowly raise the dumbbell to the starting position and squeeze the triceps. 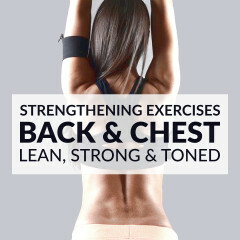 While doing the dumbbell triceps extension keep your core tight and your back flat. Breathe in as you lift the dumbbell, and maintain your upper arms stationary and close to your head. The dumbbell triceps extension targets the triceps, which are the muscles on the back of the upper arm. This exercise helps to strengthen the triceps, increases the stability of the shoulders and elbows, and sculpts the arms. Test different weights by doing a set of 12 repetitions and choose the weight that allows you to maintain perfect form but that, at the same time, still represents a challenge. Start with 2 sets of 8 to 12 repetitions and increase this number over time until you’re able to complete 3 sets of 16 repetitions of the dumbbell triceps extension exercise.